For the past several years Charlie and Charlene – the crows, have had their nest outside my window. So close I can observe everything these dear birds do to fix their nests from last year and lay their eggs and have their babies. Or that is the plan. I hope this year it will be successful. Last year they had laid their eggs. I was on my patio just a couple of feet away from them. They had clearly gotten used to me being so close as I puttered around my patio and my garden. They seemed to be at peace with this close proximity of our lives shared in some sort of way. Having finished watering my plants this one day, I turned to return indoors when suddenly I heard a screech like I had never heard before. I turned around and saw Charlie swoop down from his post across the street on the roof of the building where he kept an eye of things. Charlene was sitting on the eggs. At this same moment I saw and heard the community of crows, maybe 30, swoop in to where Charlene was sitting on her eggs. What a sight. It was extraordinary to have such an up close view of this catastrophe. The organization of these birds was a sight to behold. The whole community of crows seemed to know their positions and went right for it. Some went right into the nest with Charlene, some surrounded the nest up close and then layers of them surrounded the tree. 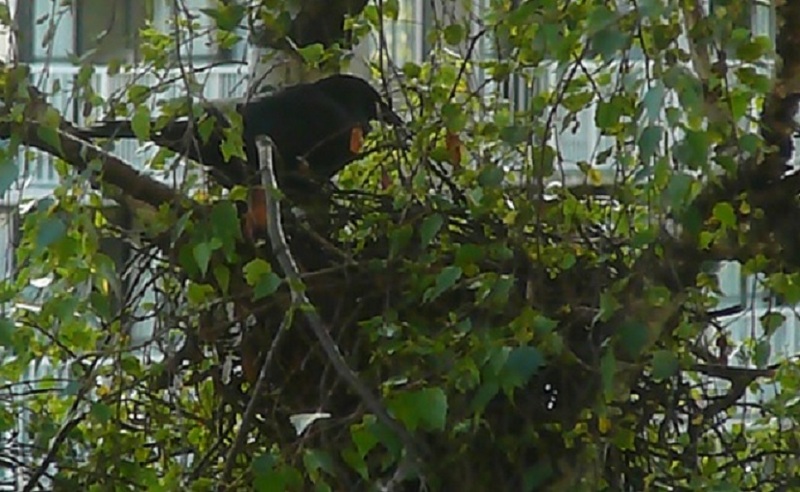 Something had gotten into the nest to take Charlie and Charlene’s eggs and they were not going to get out alive. I think it was probably a squirrel. I heard and saw, up close, a mad fight as I watched this unbelievable jumping around and commotion. I was afraid for Charlene for at first I thought they were attaching her and I couldn’t understand so I started to yell at them to leave her alone. The ones closest to me just looked at me. They could have turned en mass on me but of course didn’t. Remember they are only a couple of feet from me. Then just as quickly as it started it was silent. Charlie and Charlene didn’t have any babies that year and I was so sad for them. But they are back and I am so excited. I believe these crows, in the neighborhood, know me. Whenever people walk through this little parkette across the street the crows dive bomb them as they go by. But they never do that to me. Soon as I turn up all goes silent until I have passed then they start up again. I think we can learn from these wonderful birds, they are so smart. Most people don’t seem to like them and will break their nests should they make them near where they live, I don’t, I welcome them. I find delight and joy in watching nature at work. We need to learn from them and respect them.